Ok, stay with me here. This pasta takes 5 minutes to make. It has 5 ingredients. It’s gluten free. YOU CAN MAKE IT IN THE MICROWAVE. AND it doesn’t come from a package. WHAT??? This year, I’m trying hard to pack a lunch more often. But my go to lunch has been pasta. With marinara. And cheese. Why? Because it’s easy. I don’t want to spend hours every night prepping for a lunch that won’t even taste as good the next day. Plus spaghetti is so not what this foodie palate enjoys. The answer? BEET PASTA. With goat cheese and walnuts and rosemary. Delish. I got a spiralizer attachment when I bought my Kitchen Aid Stand Mixer a few years ago. It had been sitting, gathering dust, until I had an idea. 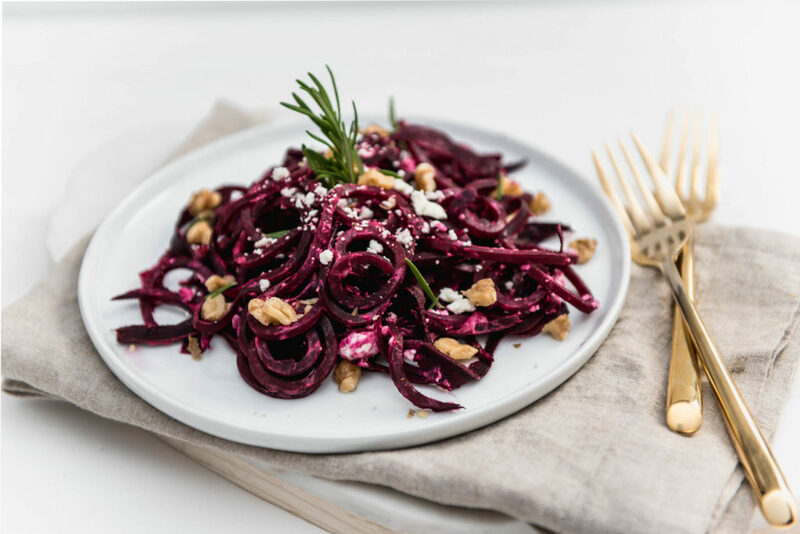 If you can make “faux” pasta from zucchini – why not try beets? P.S. 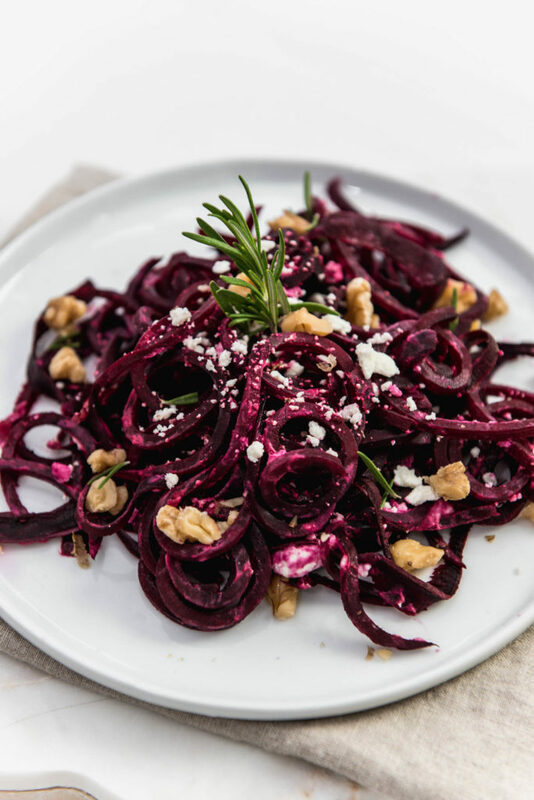 Spiralizing beets is not as messy as you’d think! I washed the beets throughly and just spiralized with the peel intact, but you can of course remove the peel before spiralizing. I’m not typically a goat cheese kind of gal – but in this recipe, the goat cheese lends the perfect amount of tang to brighten up the beets! If you prefer more of a tangy flavor, you can add a squeeze of lemon juice to add a bit of tartness to the finished dish. Without futher ado – here’s the recipe! Let me know if you try it! What combination of vegetable noodles will you dream up? Add beets to bowl, cover and microwave on high for 2 minutes. Stir and microwave for another 2 minutes. Add goat cheese and salt to hot beets and stir until melted. Garnish with rosemary and walnuts and enjoy hot! I hope I gave it 5 stars because I love beets and goat cheese ~ this is so yummy and the photography is inspiring.